EMC has just announced two new unified storage platforms: the enterprise and mid-range sized VNX and the smaller VNXe. EMC states that these two products build on the simplicity and efficiency focus it is already driving by adding affordability and power – overall its new products are “optimized for virtualized IT." VNXe: Billed as the ‘worlds simplest storage’, VNXe takes EMC into new market spaces as it is targeted for users in small and medium sized businesses, mid range organizations, or enterprises outside the data centre. Starting at $10k, this is a unified storage product designed for users that don’t (or don’t want to) eat, sleep and breath storage. Technically it has multi-cores; offers redundancy; handles CIFS, NFS and iSCSI; and runs on a 6 Gb/sec SAS back end – its target user (storage savvy or not) will know it can pretty much handle anything and everything they’re likely to throw its way. 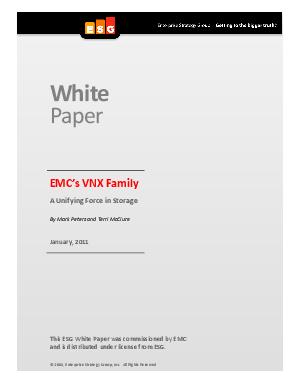 VNX: Is tagged as the “Worlds most powerful Midrange Storage”. It is the beefier cousin to the VNXe and is effectively a marriage of EMC’s two existing, market leading mid-range offerings, CLARiiON and Celerra, although with a much improved performance and operational value over either of these platforms. Very clearly an enterprise-class device, it offers much of the same features and manageability as the VNXe, but has extended capabilities exactly where one would expect them.